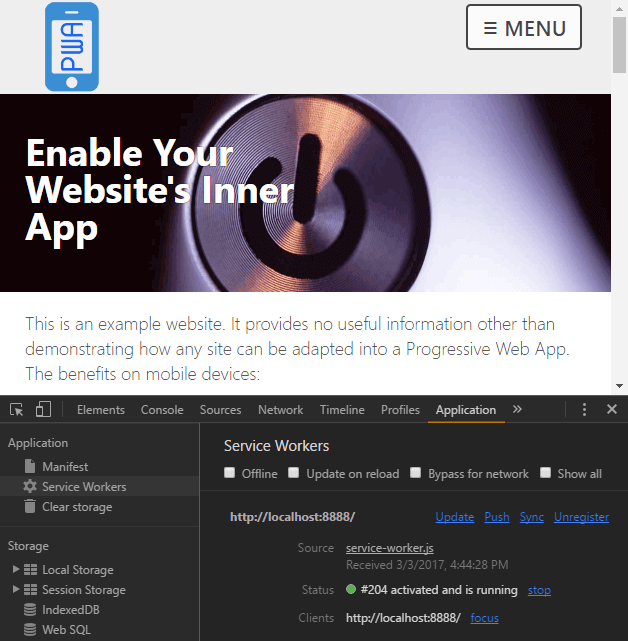 There’s been a lot of buzz around Progressive Web Apps (PWAs) lately, with many people questioning whether they represent the future of the (mobile) web. I’m not going to get into the whole native app vs PWA debate, but one thing’s for sure: they go a long way to enhancing mobile and improving its user experience. 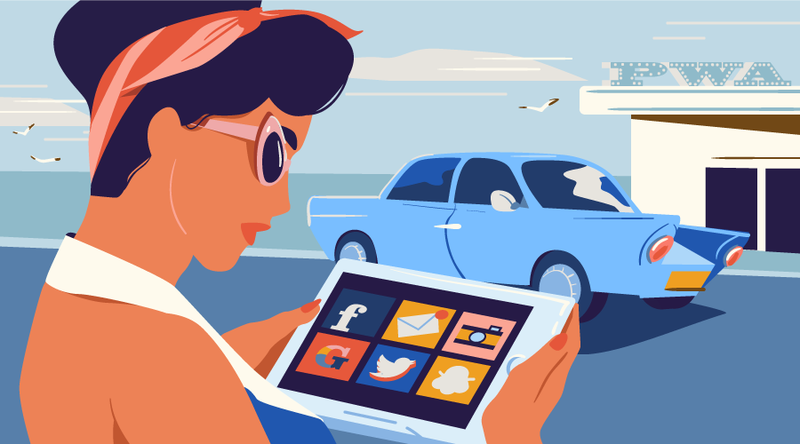 With mobile web access destined to surpass that of all other devices combined, can you afford to ignore this trend? The good news is that making a PWA is not hard. In fact, it’s quite possible to take an existing website and convert it into a PWA. And that’s exactly what I’ll be doing in this tutorial. By the time you’re finished, you’ll have a website that behaves like a native web app. It will work offline and have its own home-screen icon. You only need one app developed with open, standard W3C web technologies. There’s no need to develop separate native codebases. Users can discover and try your app before installation. There’s no need to use an AppStore, abide with arcane rules or pay fees. Application updates occur automatically without user interaction. Users are prompted to “install”, which adds an icon to their home screen. When launched, the PWA displays an attractive splash screen. The browser chrome options can be modified if necessary to provide a full-screen experience. Installation is lightweight — perhaps a few hundred KB of cached data. All data exchanges must occur over a secure HTTPS connection. PWAs function offline and can synchronize data when the connection returns. It’s early days, but case studies are positive. Flipkart, India’s largest ecommerce site, experienced a 70% increase in sales conversions and trebled on-site time when they abandoned their native app for a PWA. Alibaba, the world’s largest business trading platform, experienced a similar conversion rate increase of 76%. Your app will still run in browsers that don’t support PWA technology. The user won’t get the benefits of offline functionality, but everything will continue to work as before. Given the cost-to-benefit rewards, there’s little reason not to add PWA technologies to your system. Google has led the PWA movement, so most tutorials describe how to build a Chrome-based, native-looking mobile app from the ground up. However, you don’t need a special single-page app or have to follow material interface design guidelines. Most websites can be PWA-ized within a few hours. That includes your WordPress or static site. Demonstration code is available from GitHub. In the above code, [port] is optional, and defaults to 8888. Open Chrome or another Blink-based browser such as Opera or Vivaldi, then navigate to http://localhost:8888/ (or whichever port you specified). You can also open the Developer Tools (F12 or Cmd/Ctrl + Shift + I) to view various console messages. 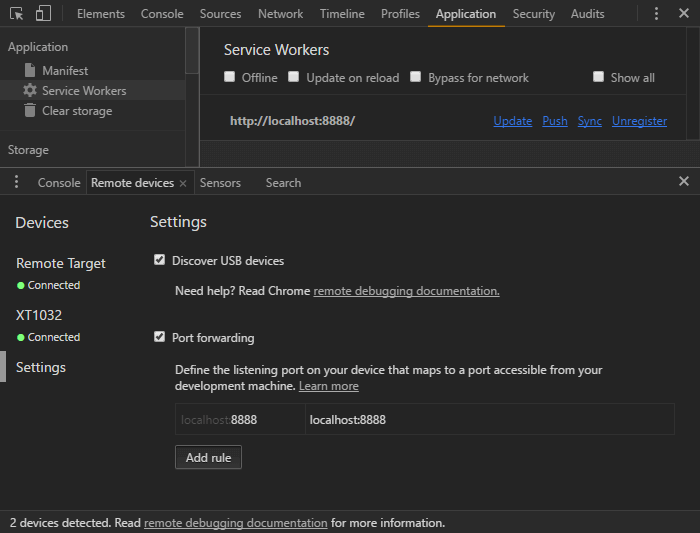 check the Offline checkbox in the Network or Application – Service Workers tab of the Developer Tools. You can also view the demonstration page on an Android smartphone connected to your PC/Mac via USB. Open the Remote devices panel from More tools in the top-left three-dot menu. Select Settings on the left and click Add Rule to forward port 8888 to localhost:8888. You can now open Chrome on the smartphone and navigate to http://localhost:8888/. You can use the browser menu to “Add to Home screen”. Make a couple of visits and the browser should prompt you to “install”. Both options create a new icon on your home screen. Browse a few pages, then close Chrome and disconnect your device. You can then launch the PWA Website app. You’ll see a splash screen and be able to view pages you read previously, despite having no connection to the server. PWAs require an HTTPS connection, for reasons that will become apparent shortly. Prices and processes will differ across hosts, but it’s worth the cost and effort, given that Google search is ranking secure sites higher. The web app manifest provides information about the application such as the name, description and images, which are used by the OS to configure home screen icons, splash pages and the viewport. 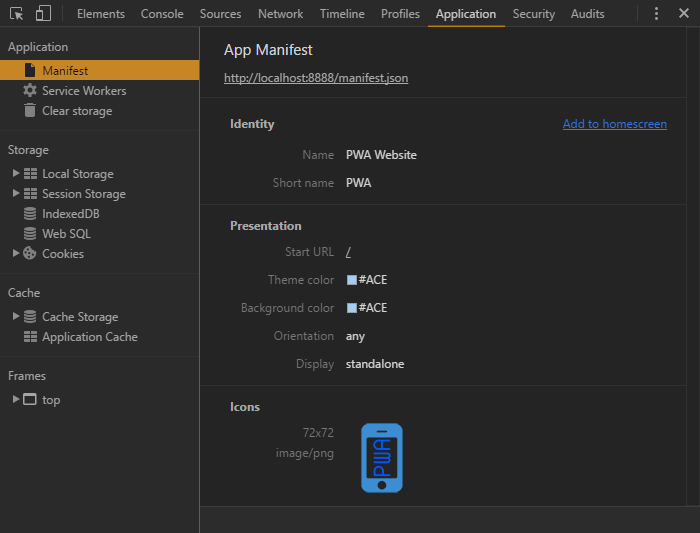 In essence, the manifest is a single file alternative to the numerous vendor-specific icon and theme meta tags you may already have in your pages. icons: an array of image objects defining the src URL, sizes and type (a range of icons should be defined). MDN provides a full list of Web App Manifest properties. If you don’t need offline capabilities, simply create an empty /service-worker.js file. Users will be prompted to install your app! Service workers can be bewildering, but you should be able to adapt the demonstration code for your own purposes. It’s a standard web worker script that the browser downloads (when possible) and runs on a separate thread. It has no access to the DOM or other page APIs, but will intercept network requests triggered by page changes, asset downloads, and Ajax calls. This is the primary reason your site requires HTTPS. Imagine the chaos if a third-party script could inject its own service worker from another domain. It would be able to examine and modify all data exchanges between the client and server! Service workers react to three primary events: install, activate and fetch. This occurs when the application is installed. It’s typically used to cache essential files using the Cache API. The cache name (CACHE) and version (version). 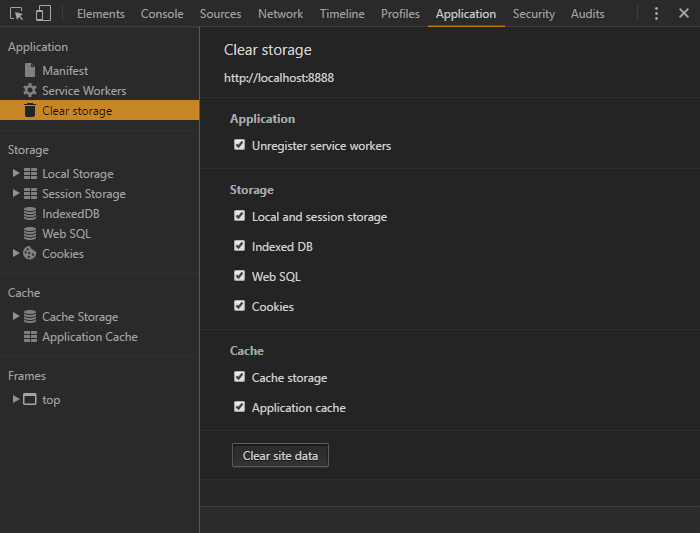 Your application can have multiple cache stores, but we only require one. A version number is applied, so if we make significant changes, a new cache will be used and all previously cached files are ignored. 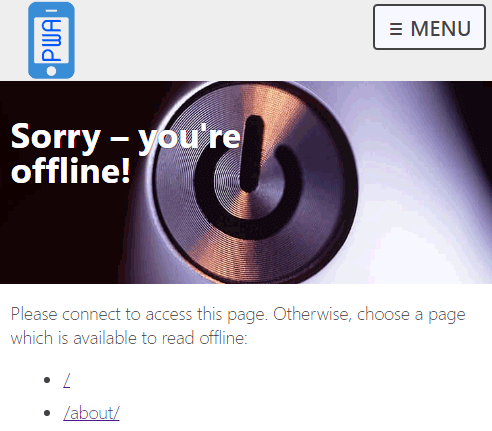 An offline page URL (offlineURL). This is a page which will be presented when the user is offline and attempts to load a page they haven’t visited before. Optionally, an array of desirable files (installFilesDesirable). These will be downloaded, if possible, but won’t make the installation abort on failure. 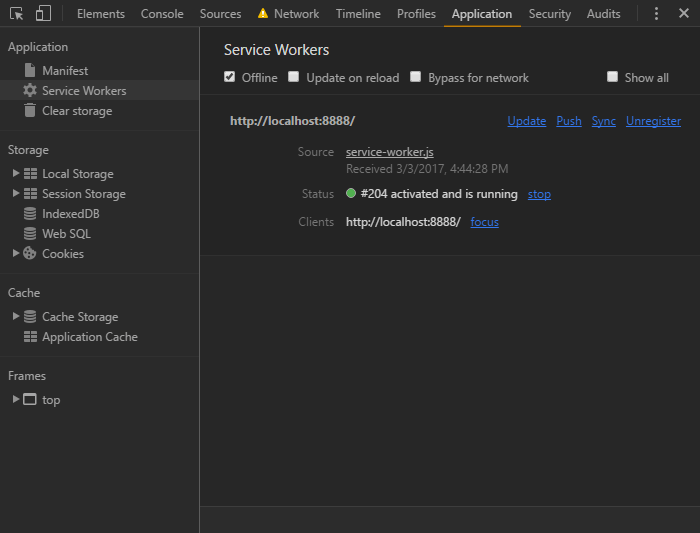 Note the final self.clients.claim() call sets this service worker as the active worker for the site. An asset from the cache. If #1 fails, the asset is loaded from the network using the Fetch API) (unrelated to the service worker fetch event). That asset is then added to the cache. If #1 and #2 fail, an appropriate response is returned. The offlineAsset() function checks whether the request is for an image and returns an SVG containing the text “offline”. All other requests return the offlineURL page. The offline page can be static HTML informing the user that the page they requested is not available offline. However, we can also provide a list of page URLs that are available to read. You should consider running your app in an Incognito window during development, since cached files are not retained after you close the tab. Finally, the Lighthouse extension for Chrome also provides useful information about your PWA’s implementation. Progressive Web Apps require new technologies, so some caution is advised. That said, they’re an enhancement of your existing website which should take no longer than a few hours and have no negative effect on unsupported browsers. The demonstration site hides the URL bar, which I would not recommend unless you have a single-URL app such as a game. The manifest options display: minimal-ui or display: browser are possibly best for most sites. You could cache every page and asset on your site. That’s fine for small sites, but would it be practical for those with thousands of pages? No one is likely to be interested in all your content, and device storage limits could be exceeded. Even if you only store visited pages and assets like the demonstration, the cache could grow excessively. providing a “store this page for offline reading” button so the user can choose what to cache. 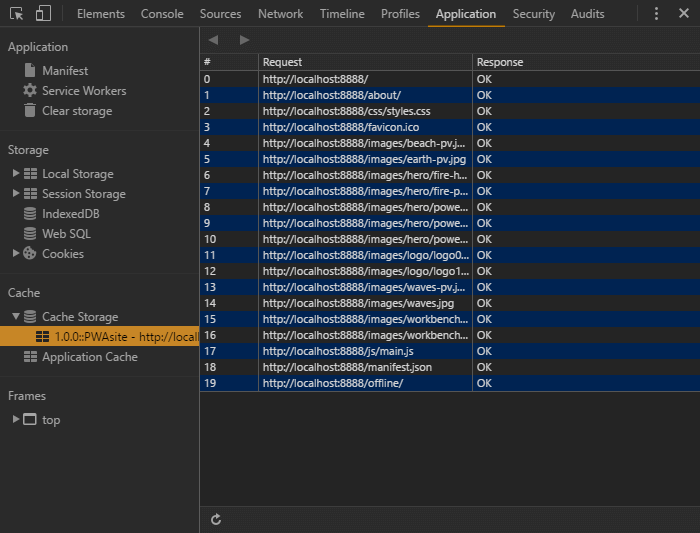 The demonstration looks for assets in the cache before loading from the network. That’s great when users are offline, but means they could be viewing old pages even when they’re online. You could also consider cache-busting techniques to ensure older assets cannot be used — for example, naming your CSS file styles-abc123.css and changing the hash on every release. Caching can become complex, so I’d recommend you read Jake Archibold’s Caching best practices & max-age gotchas. There are also many articles online that influenced how I approached this demonstration code. Feel free to adapt the code and let me know how it went. Best of luck! This article was peer reviewed by AJ Latour, Panayiotis «pvgr» Velisarakos and Dave Maxwell. Thanks to all of SitePoint’s peer reviewers for making SitePoint content the best it can be!